The perfect geometry and exquisite beauty of nature is nowhere so clear to us as in the snowflake. But how have we been able to appreciate this infinitesimal wonder in all its crystalline glory? This book, as much a work of art as a testament to science, reveals how one of the snowflake’s most inspired photographers came to such intimate knowledge of his craft and its fleeting focus. 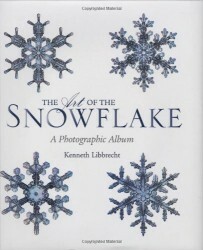 Beautiful pictures illustrate Kenneth Libbrecht’s story of the microphotography of snow crystals, from the pioneering work of Wilson Bentley in the 1890s right up to Ken’s own innovations in our age of digital images. A breathtaking look at the works of art that melt in an instant, this is a book to page through and savor, season after season.